Fun Vietnamese girl power which does the Roger Corman trick of masking it’s message of female empowerment in sexually provocative bathing scenes. A quartet of lethal, colour-coded, beautifully manicured sexpots lure hapless men into their beach-bound bamboo tavern like sirens in Greek mythology and use their wire-fu swordplay to rob them blind. A rich general’s daughter winds up in their group and sticks out like a fifth Beatle. The team are initially hostile towards Linh (Tang Thanh Ha) until she vows to learn their deadly skills to take revenge for the death of her family. Her training mostly involves kicking a computer generated ball over a net, singing the occasional pop song and getting pissed. There is nothing of any grit or edge to the film, and despite being heavily sexualised and occasionally violent (much of the more extravagant blood-letting has been crudely added in post-production), the film still feels gentle if not oddly soothing. This may have something to do with the idyllic Vietnamese setting, which certainly adds to the film’s glamour; mountains, fields, beaches, bamboo huts, rock pools and sunsets, all highlighted in luscious greens and turquoise. It’s enough to make you want to book a week at a yoga retreat. 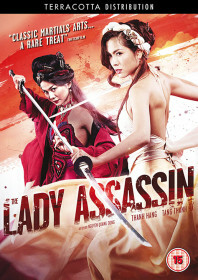 The Lady Assassin is available to buy on UK DVD from Terracotta Distribution.